Want to take-off from a summit? 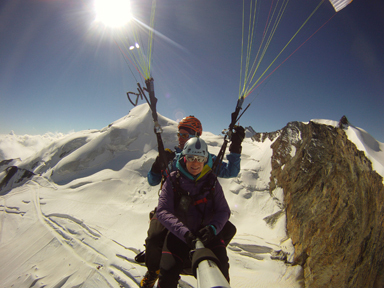 Paragliding Gruyère has been offering the Hike and Fly activity for several years now. Mountain walking and downhill paragliding make the perfect combination. To take part in this activity, you must be fit enough to walk for at least 1.5 hours carrying a small backpack. Your pilot will carry the paraglider and you only have to carry a few pounds more to help them on this hike in the Prealps or in the Alps. The Hike and Fly usually takes place in the early morning to ensure gentle, steady wind conditions at the top. You normally meet at around 7.30 am. Our tandem Hike and Fly pilots all have extensive experience in mountain flying and will be delighted to share their knowledge of the countryside and paragliding with you.